Geeta Hippie clothes. Geeta Bohemian clothing. Artsy clothing for expressive women! Since 1972 Geeta of India has lead the way in creating classic gypsy hippie chick bohemian shabby chic styles for women and juniors. Handmade boutique styles at affordable prices. 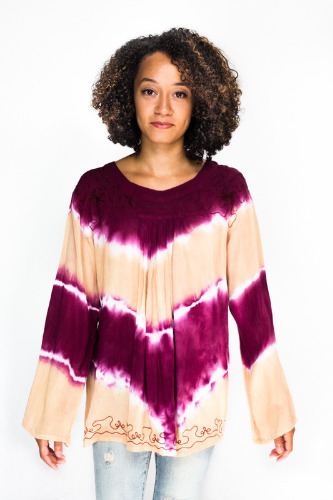 100% crinkle tie dye rayon crepe peasant gypsy smock blouse with beautiful embroidery throughout the neckline and hem. Squareish neckline, long sleeve. This top comes in a stripe pattern across a solid color top. You may choose the main color of the blouse and the tie dye patterns will be multicolor. Because of the hand tie dye process, the patterns might not look exactly like the picture because no two tie dye patterns ever match perfectly. The perfect simple blouse that goes with everything. Check the measurements below.